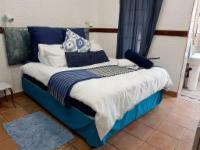 Magia Guest House provides luxury accommodation to suit your needs. We can provide deluxe rooms and family rooms, we also cater for large groups and self-catering apartments. Each room at this guest house is air-conditioned and features a flat-screen TV. Some rooms include a seating area for your convenience. You will find a kettle in the room. Each room includes a private bathroom. You will find a 24-hour front desk at the property. Wi-Fi is available in all areas and is free of charge. There is also private parking is possible on-site. Guests can enjoy numerous great attractions in and around the area, such as the Kgaswane Mountain Reserve and the Paul Kruger Country House Museum. Magia Guest House is 1.4km from the centre of Rustenburg Oos-Einde , the nearest airport 36.4km (Pilanesberg International Airport).